Innovative Carrier products are trusted in more homes than any other brand–and financing is no different. Through our relationship with UEI Financial, participating Carrier dealers offer a variety of flexible options for financing your new Carrier product or system. Canadian Comfort has been providing London, ON with top-quality heating and cooling services for more than 24 years. As a family-owned and operated business, we are dedicated to providing the best possible air conditioning installation and air conditioning repair in London. We take the time to get to know you personally, so we can provide the best solution to meet your family’s unique needs. We also offer same-day air conditioning service & furnace repair . We’ve earned a reputation for getting things right the first time – which means less time and worry for you. 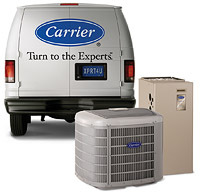 As an authorized Carrier dealer, we’re proud to deliver industry-leading heating and cooling equipment. Carrier invented air conditioning more than 100 years ago and has since remained the world leader for high-technology heating and cooling solutions. Carrier’s healthy-air experts are committed to ensuring healthy and comfortable environments in the home, and so are we. Our customers feel good about putting their trust in a brand with such acclaimed reputation and history. We’ve taken care to ensure each employee, HVAC technician and contractor is properly trained and certified. Our friendly team of experts will see your job from start to finish and ensure performance meets your expectations. Of course, we’re always on standby to replace or repair your HVAC system if any issues arise. We provide same-day service for air conditioning and furnace installation or repair, as well as 24-hour emergency service. Experience the Canadian Comfort difference – a legacy of complete customer satisfaction spanning 24 years.